Home→Telecoms→Is 40% of telecoms value about turf not technology? Is 40% of telecoms value about turf not technology? When you think of the telecoms business what springs to mind? Probably a mobile device or a box with flashing lights (switch, router,…). Perhaps it should be a shovel. Physically reaching the end customers with the network is a major source of value in the telecoms industry. 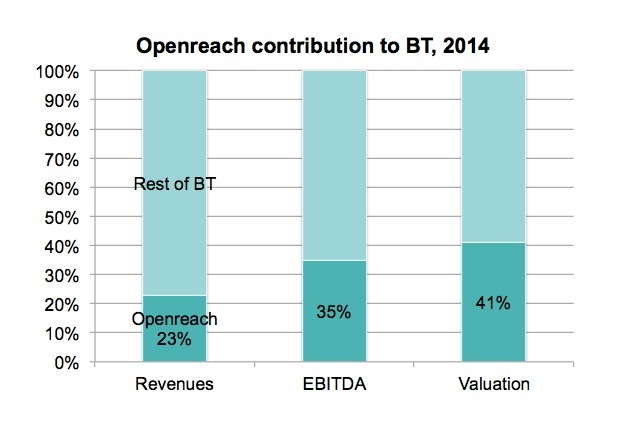 According to a 2014 UBS analysis, Openreach – the part of BT that is responsible for the copper wires and fibre that connect homes and businesses – accounts for 23% of BT’s revenues and 41% of its overall enterprise valuation! Many telecoms companies don’t manage this physical access business so distinctly, but you can see that we need to clearly understand the dynamics of this part of the sector if we are to think strategically about the overall market. In my FASP4 framework, I call this the “Place” layer. This post is an introduction to that layer. We will explore the so-what of this later, but for now let’s get the main characteristics straight. At its heart, this business is about securing and managing permissions and rights-of-way, about civil works (digging!) and the management of basic physical infrastructure (ducts, towers, …). Ownership of spectrum would also fall into this category. It’s a geographic business. Investments will be often be measured in linear distance (metres or km, for wired access) or perhaps surface area (for spectrum/ frequency band). Value comes from being present in the right location. As any retailer will tell you, it’s all about location, location, location! Unlike much of the sector, success does not depend on scale. Competitive advantage comes from exclusivity. It’s a low innovation business. A duct is a duct. A tower is a tower. Investment cycles are relatively long. Nobody puts fibre in the ground expecting to replace it in five years. No, we are talking about 20 or 30 year investment cycles, sometimes longer (cough, copper, cough…). It’s a low risk business. But not without risk! The main risk is the location covered reduces in value, or alternative technologies emerge to reduce the uniqueness/exclusivity of the investment. For example, the copper network loses value when a parallel fibre network is deployed by a competitor. The right to hang a Wi-Fi access point in a coffee shop declines in value when a citywide network installs an access point just outside in the road. The cost driver is in the “right of access”. In other words, it is getting the duct when you want it to go, rather than how many fibres you shove down the duct, that drives your cost. It is getting the right to install the cell tower, rather than how many hanging fixtures you provide, that drives your cost. You are selling what is effectively an “un-contended resource”. In other words, you sell a discrete “thing” – a fibre, a hanging right – and not a “share of a thing”. You can argue that this is not strictly true: fibre can be seen as “a share of a duct”, for example. But in general, once the access is in place, supply far outstrips demand for a given un-contended resource: a (modern) duct should be able to provide more fibres than needed. So success can be measured in “sales of (un-contended resource) per right of access”. How many cellular operators buy space on a single tower? How many ISPs buy a fibre strand in one of your ducts? This is the fundamental business driver and model at the ‘place’ layer of the FASP4 framework. Overall, then, we can say that “Place” is a geographic business, all about exclusive access to the best locations. does it really make sense to manage 20-30 year investment cycles in the same company that manages the 1 or 2 year life cycles of consumers? If sales per right of access is the key driver, how does that stack up with the vertically integrated models we often see? How can we get adoption of, say, fibre access, to over 100% rather than, say, 34%? Clearly, there is plenty to think about here. Stay tuned. Do you agree with my summary of the Place layer of the FASP4 framework? Would you add additional insight or nuances? Actually not that surprising as Access is in my opinion the major asset of Telecom operators. Hello, and thanks for the comment. You are right that “access” is a major asset. I suppose I would just say that it is more the “access infrastructure” than the “access network (electronics)” that is the key asset. As for the level of innovation – you are right that there have been significant innovations on the civil works side. The key phrase is “over the years”, as you put it yourself. I would say it is not a no-innovation business but a low-innovation business. Compared with the speed of other parts of the FASP4 framework, it is still the most slow-moving and stable business.